Saturday night. Relaxing at a friend’s house. Dinner is over, and we are all sitting around the dining table. The room is strangely quiet. Everyone at the table has a look of intense concentration, and the only sounds are the occasional shrills and pings produced by our various laptops and smartphones. No, this isn’t a strange vision of a scary post-social-skills future. It was just last week – on the Saturday we all finally discovered the phenomenon that is Words With Friends. 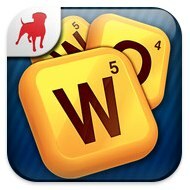 Words With Friends is an online word game from Zynga, available for iOS, Android and Facebook. It’s basically Scrabble, albeit with the bonus squares slightly rearranged. It’s been around a while, but seems to be experiencing a surge in popularity. Extra points are given if words are played over special squares such as “double word score” or “triple letter score.” Players take it in turns to lay words on the board until the entire pool of letters is used up, and the player with the highest score wins the game. Words With Friends is exactly the same…but online. Players invite friends, usually via Facebook, and can play multiple games at the same time. Within an hour of discovering the game, we found that many of our friends were already playing, and each of us soon had five or six games on the go at once. There are no time limits. For those that only log on occasionally, a game of Words With Friends can be something akin to postal chess, with only a few moves happening each day. For people who spend their lives glued to their iPhones and Facebook pages, playing Words With Friends can be both an enjoyable quick-fire challenge and something akin to a fun full-time job! The beauty of Words With Friends is that it really is the perfect mobile game. The iPod and Android apps can consume long train journeys with ease, but also provide perfect gaming fodder for two-minute waits in supermarket queues. The game is supported by advertising. In the case of the Facebook game, this involves looking at an ad for 5 seconds in between moves – this can quickly become tiresome. On the iOS app, the ads appear but can be skipped instantly. For those that want to play a lot (probably anyone with a few Facebook friends willing to get involved) the ads can be disabled for a small fee with the purchase of the full game. Most people playing in our group have paid the money – which goes to prove that this freemium payment model works for compelling games. Who can begrudge a few dollars for something that provides hours of enjoyment at home, on the train, and even queuing at the airport. The best thing of all about Words With Friends is that it isn’t simply mindless entertainment. If something’s going to keep you glued to your iPhone screen, isn’t it best that it’s something that focuses the mind and increases the vocabulary? This point seems to be the key to the game’s popularity. All it really consists of is Scrabble, turn based online gaming (that must have been pretty easy to put together), and a bit of brain training. Yet somehow it ends up being far more than the sum of its parts. 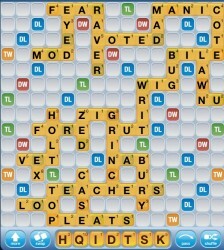 Now, if you’ll excuse me, I somehow need to get more than forty points with four As, two Hs and a Q.